Meet all ASTM, TUV, and GS quality and safety requirements. A zipper enclosure allows easy in-and-out, the rust-resistant frame will hold up to years of heavy outdoor use. 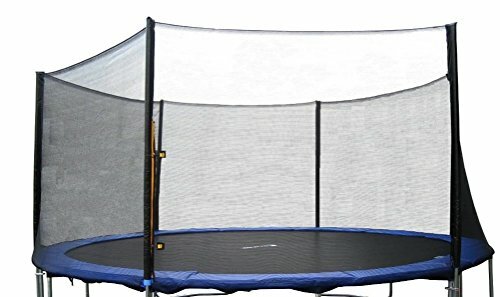 Details: Creates a Fun Jumping Environment without limiting Visibility; PE mesh netting; Rust-resistant galvanized steel frame padded with protecting foam for the poles ; All materials are made with durable UV protected material for increased weather resistance; Sturdy straps and ropes to secure net to trampoline. Trampoline replacement outer safety enclosure for ExacMe 6 U Legs 15-foot T-series outer trampoline, it only fit ExacMe 6 U Legs 15-foot T-series outer trampoline (model number 6080-T015). Trampoline is not included.